Midnight strikes, heralding in a new day, yet an evilness weaves through its hopefulness. The witching hour has begun. All Hallows Eve is here. A silence falls across the land. An eerie expectant feeling wakes many from their disturbed dreams as they find themselves compelled to look out of their windows into the night sky. They look, but can see nothing and return to their beds, troubled by their thoughts, unsure of the strange noises they thought they might have heard. A whoosh of a brush, a cat meowing, a distant cackle. The noises fade leading them back to a disturbed sleep. One by one they begin to appear in the streets. Gently landing onto the ground. No sound could now be heard. Dressed in darkness; emerald, midnight blue and blood red. they all stand silently waiting to begin. 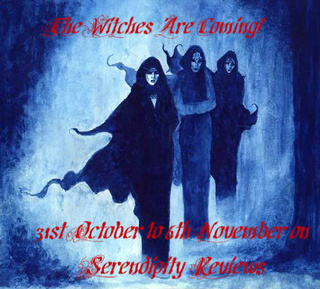 Join me for a week of wicked witchiness as I lead you through some of the best witch books around. Lots of guest posts and witchy fun! I can't wait(well I couldn't really because I read one of the reviews first LOL).